Virginia has been in the news lately, what with the governor and other high-ranking officials having admitted to being insensitive fools. It’s time to visit their beautiful capitol…before the stink in Richmond damages it further. We return to the STATE CAPITOL ODYSSEY. It is the Commonwealth of Virginia, one of four U.S. states so designated, the others being Kentucky, Massachusetts and Pennsylvania. The term is a traditional English reference to a governing body dedicated to the common good. The colony began in Jamestown as the first permanent English settlement in the New World. As the colony grew and government was established, Jamestown became the capitol. 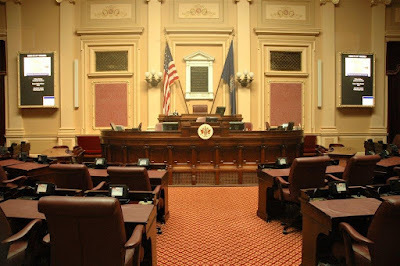 The first colonial legislature, the House of Burgesses, began meeting there in 1619. 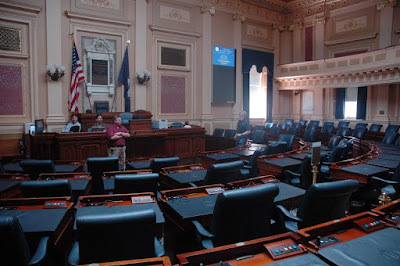 When England’s rebellious period included a twelve-year stretch before 1640 without a functioning Parliament, Virginia’s House of Delegates became the oldest continuous English-speaking legislative body in the world. How’s that for trivial excess? 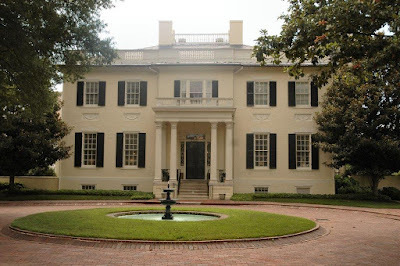 In 1699, the capitol was moved to Williamsburg and remained there until Governor Thomas Jefferson suggested a more central location for the new state’s government. Richmond has been the capital since 1780. Before he became the third president, Thomas Jefferson was our Minister to France. The man did everything. In his free time, he designed the capitol building for the new state. It was modeled after a favorite Roman temple he had seen, the Maison Carrée in Nȋmes. 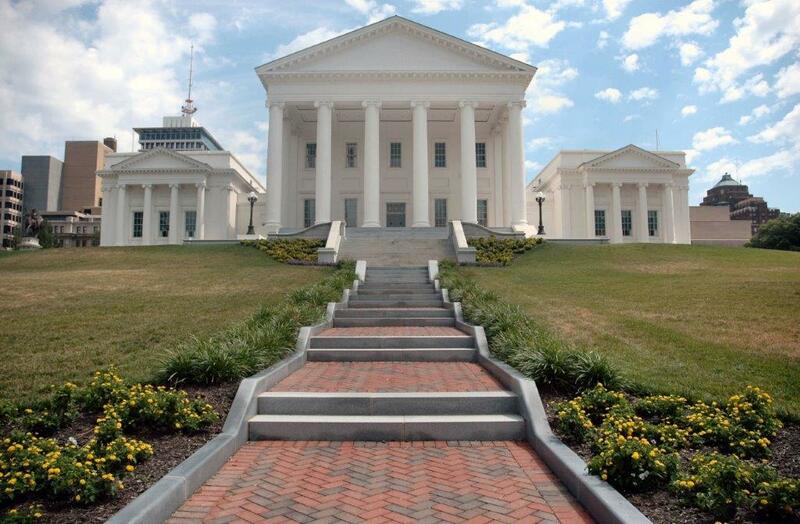 As our nation’s state houses go, only the Maryland capitol in Annapolis is older. I was on the home stretch of the road trip that ended the DEAD PRESIDENTS QUEST having driven to Kansas and then Texas to pay my respects to Dwight Eisenhower and Lyndon Johnson, respectively. All the stops along the way became the start of my state house chase…a great loop through the American Midwest and South that captured eleven special, historic, public buildings. Richmond was the last stop on the journey. The photo at the top shows the east and west wings that were opened in 1906 to hold the House of Delegates and Senate. From 2004 to 2007, the historic Capitol was restored, renovated and expanded…so I arrived right after that to a rather pristine appearance. Jefferson did not want to add a dome to his classic Roman exterior design but one is visible from the inside. Under the dome is a life-size statue considered the finest representation of George Washington ever made. French sculptor Jean-Antoine Houdon visited the general in 1785. He took many measurements, made a life mask and went home to add that face to a block of fine Carrara marble. It has been in this spot since 1796. 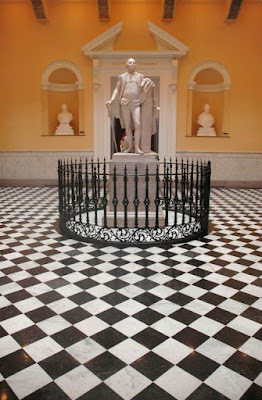 Virginia’s favorite Son is surrounded by busts of the other seven presidents born in the state – Jefferson, Madison, Monroe, William Henry Harrison, Tyler, Taylor and Wilson. During the Civil War, the House of Delegates chamber served a second purpose as the legislature of the Confederate States of America. It is now a museum with busts of the many famous Sons of Virginia. 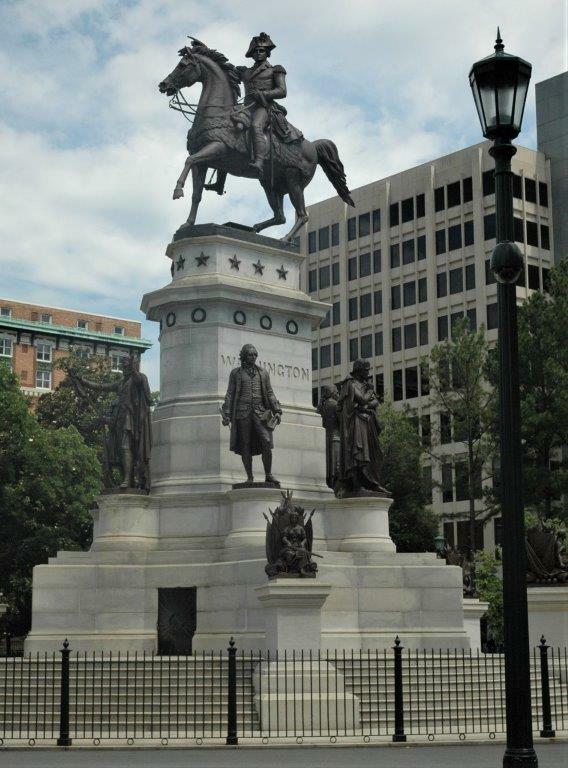 A full-size statue of Robert E. Lee stands where he stood on April 23, 1861 when he accepted command of the Army of Virginia. 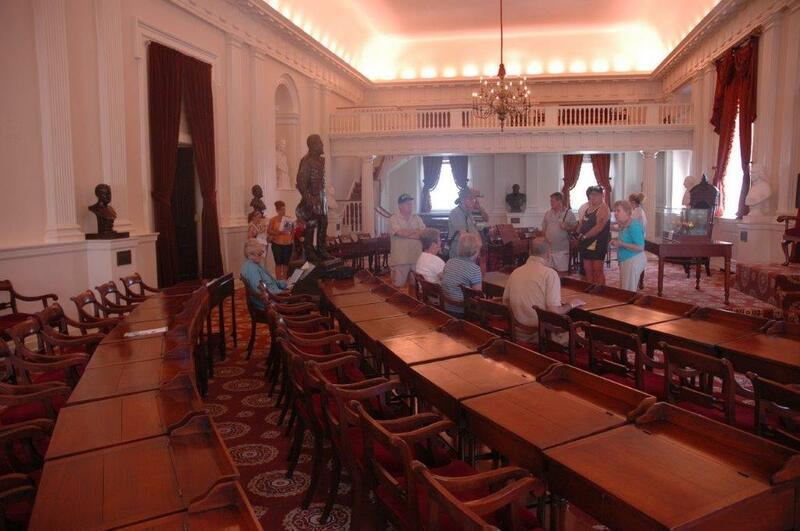 The desks and chairs (also designed by Jefferson) are copies since most of the originals were destroyed in 1870 when an overcrowded courtroom on the floor above crashed through to the chamber, killing 62 people and injuring 251 more. Begun in 1850 as a tribute to George Washington and other Virginians who contributed to the revolution and our independence, the monument was completed in 1858. The design included a tomb for our first president, but his family honored Washington’s desire to be buried at the family home in Mt. Vernon.